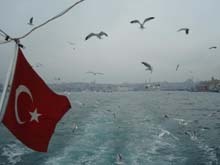 Istanbul is Turkey’s most populous city, and its cultural and financial center. The city covers 25 districts of the Istanbul province. 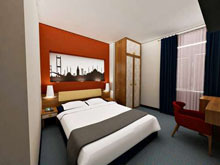 It is located at 41° N 29° E, on the Bosphorus strait, and encompasses the natural harbor known as the Golden Horn, in the northwest of the country. It extends both on the Europen (Thrace) and on the Asian (Anatolia) side of the Bosphorus, and is thereby the only metropolis in the world which is situated on two continents. In its long history, Istanbul (Constantinople) served as the capital city of the Roman Empire (330-395), the Byzantine Empire (395-1204 and 1261-1453), the Latin Empire (1204-1261), and the Ottoman Empire (1453-1922). The city was chosen as joint European Capital of Culture for 2010. 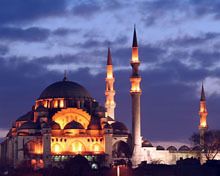 The "Historic Areas of Istanbul " were added to the UNESCO World Heritage List in 1985. Across the country, there are thousands of archeological sites, historical places and ancient cities, as well as magnificent scenic spots and natural wonders. Since Roman times, Asiatic Turkey has been known as both "Asia Minor" and "Anatolia". The European part of Turkey is called Thrace. These lands have been continually inhabited since the Stone Age. Because Anatolia is located like a natural bridge between continents, no other country in the world has acquired so many historical treasures. The Aegean Sea, the Dardanelles and the Bosphorus form the western boundaries of the Anatolian peninsula. Beside the Dardanelles are the ruins of the famous city of Troy — a memento of thousands of years of history- and on the shores of the Bosphorus rises Istanbul in all her beauty and splendor, keeping the memories of her past alive. 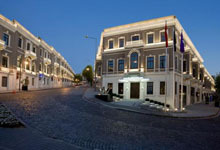 There are many legends related to the foundation of Istanbul. According to the best known one, around 650 BC, a sea tribe from the Aegean left their city Megara and began to look for a new homeland under the leadership of Byzas. According to the customs of the age, before any such undertaking an oracle had to be consulted. The oracle in the Apollo temple in the famous town of Delphi advised Byzas to settle opposite the "land of the blind". The migrants searched for such a land for a long time. When they came to the headland of present-day Istanbul, they were delighted with the fertile lands and the advantages offered by the natural harbor, the Golden Horn. They also noticed the people living across the stretch of water. The migrants decided that those people must have been blind if they could not appreciate the opportunities of this ideal place and settled on the opposite shore, and they were convinced that they had found the land the oracle had described. Excavations have revealed finds dating back to the 3rd millennium BC at the tip of the Golden Horn and on the Asian side. The city of Byzantium existed as an independent state, but succumbed from time to time to the superior powers ruling the region. The acropolis of the city stood where Topkapi Palace stands today. 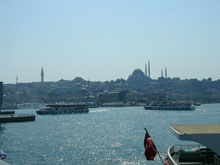 It had a well-protected harbor, still used today, in the Golden Horn. A fortified city wall starting here surrounded the city and reached the Sea of Marmara. Byzantium was an important seaport and a center of trade under the Roman Empire. However, it sided with the wrongparty during a struggle for the throne in 191 AD, and after a siege that lasted two years, it was conquered and razed by the Roman Emperor Septimius Severus. The same emperor later reconstructed the city on a larger scale. New city walls were built and the city was adorned with new buildings. By the 4th century AD the Roman Empire had expanded considerably, and the capital Rome lost its central position in the empire. While looking for another city as his new capital, the Emperor Constantine the Great finally chose Istanbul, realizing the strategic position of the city at the intersection of sea and land routes and the importance of its perfect climate. New city walls were constructed, enlarging the city again, and numerous temples, governments, palaces, baths and a hippodrome were built . Finally in 330 AD it was officially declared . the capital of the Roman Empire. Many ceremonies were organized for the occasion, which marked the beginning of a golden age. Although the city was initially called the Second Rome or New Rome, these names were soon forgotten to be replaced by "Byzantium" and in later ages by "Constantinopolis", while the people favored the name "Polis". The successors of Constantine the Great continued to improve and beautify the city by building new avenues, aqueducts, monuments and edifices. The first churches in the city were also built after the time of Constantine. The Roman Empire was divided into two in 395 AD. Although the Western Empire collapsed in the 5th century, the Eastern Empire, which was administered from the capital, Istanbul survived for over 1,000 years afterwards. This empire was named as the Byzantine Empire by modern historians. Byzantium had a very interesting history, because its development was influenced both by the earlier Anatolian civilizations and, more importantly, by Christianity; its laws and rules were adopted from Rome, but its pomp and ceremonies from the East. The city was enlarged once more with the erection of new city walls in the first half of the 5th century. The magnificent city walls on the landward side that we see today were built by Emperor Theodosrus If. They are 6,492 m long. In the 6th century, the city, that now had a population of over half a million, lived through another golden age during the reign of Emperor Justinian. The famous Hagia Sophia is the work ot this emperor. The later history of the Byzantine Empire and its capital Istanbul is filled with palace and church intrigues and Persian and Arab attacks. The throne frequently changed hands after bloody feuds between royal families. Between 726-842, all kinds of religious images were outlawed in the city during the iconoclastic movement.This led to much destruction (and much concealment) of paintings and statues. The Latin invasion was a dark page in the history of Istanbul. It started with the invasion of the city by the armies of the Fourth Crusade in 1204, and for many years all the churches, monasteries and monuments in the city were robbed of their treasures. Although the Byzantines regained control of the city in 1261, Istanbul never fully recovered its former wealth. increasing threats of the expanding Ottoman Empire finally came to an climax when, following a siege of fifty-three days in 1453, the city was captured by the Turks. The large caliber cannons of Sultan Mehmet, the Conqueror, used for the first time in history, were one of the factors that enabled the Turks to penetrate the city walls of Istanbul. Another factor contributing to the conquest was that the Byzantine Empire had reached the end of its natural life span. Mehmet, who was only 21 years old then, moved the capital of the Ottoman Empire to Istanbul, increased the population of the city by bringing in immigrants from different regions of the country, and started to reconstruct the deserted and wrecked city. He granted freedom of worship and social rights to the former inhabitants. It was thanks to the rights granted by Mehmet that the Patriarchate of the Greek Orthodox is even today located in Istanbul. Some of the dilapidated churches in the city, including Hagia Sophia, were renovated and converted into mosques. Istanbul was fully reconstructed within a short period after it was conquered by the Turks. A century later, Turkish art had left its mark on the city, and domes and minarets dominated the skyline. In the 16th century, when the Ottoman Sultans assumed the office of Caliphate, (chief civil and religious authority of Islam) Istanbul became the center of the Islamic world as well. The city was totally reconstructed and acquired a magical ambiance under the sultans. Although no wars featured in Istanbul's history during this time, frequent fires repeatedly devastated large sections of the city. The Imperial Topkapi Palace built on the site of the old acropolis commands an extraordinarily beautiful view of the Bosphorus and the Golden Horn. As a result of closer contacts with the West, mosques and palaces in European style were built along the shores of the Bosphorus by the 19th century. These numerous palaces, built in a very short time, also symbolize the decline of another empire. 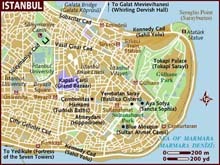 For at the end of World War I Istanbul witnessed the collapse of the Ottoman Empire. The Ottoman Empire was broken up and while the internal and external enemies were fighting among themselves for a larger share of the spoils, one of the valiant commanders of the Turkish army was engaged in a struggle on behalf of the Turkish Nation. This national hero, Mustafa Kemal, founded the Republic of Turkey after a war of independence that lasted more than four years. Mustafa Kemal Ataturk assumed the Presidency of this first republic in Asia, and changed the course of his country toward the principles of western civilization. The Sultan and his family were exiled, the Caliphate was abolished, the Latin alphabet was adopted, the fez and veil were outlawed, and women were granted voting rights. By the time Ataturk died in 1938, the Republic of Turkey was already recognized as a member of the western world. The relocation of the capital to Ankara never reduced the importance of Istanbul, and this incomparable city continued to maintain its enchanting appearance and life style. The Republic of Turkey has now proceeded for 75 years on the path of reason, based on scientific thought and facts, that was pointed out by Ataturk. The people of the country are determined to continue their march in the direction of contemporary civilization. The next millennium will be an even more prosperous age for the secular and democratic republic. The citizens of the country will follow in the footsteps of Ataturk as individuals who are independent, enlightened, unfettered in life and religion, at liberty in prayer and education, free in will, and loyal to the country.